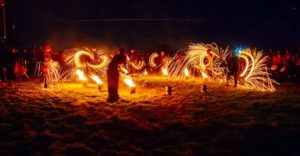 What is the Beltane Festival and how is it connected to May Day? The Beltane festival is a living, dynamic reinterpretation and modernisation of an ancient Iron Age Celtic ritual and is the largest of its kind. Having been resurrected as a practice in 1988 it has become a central focus for our community, bringing many many people together to acknowledge and revel in the birth of the Summer and the fertility of the land. It is important to note that the purpose of our festival is not to recreate ancient practices but to continue in the spirit of our ancient forebears and create our own connection to the cycles of nature. « Vernal Equinox ~ Have You Ever Wondered?